In the large bowl of an electric mixer, cream the butter and sugar at medium speed for 4 to 5 minutes until it is light and fluffy, scraping down the side of the bowl often. Add the eggs, one at a time, bathing well after each addition. With the mixer at low speed add the dry ingredients to the egg mixture, alternating with the sour cream and rosewater. Beat well. Divide the dough into 3 pieces and wrap each in plastic. Refrigerate for at least 4 hours or overnight. Preheat oven to 375 degrees F. On a well-floured surface, roll each piece of the chilled dough into a circle about 1/4-inch thick. 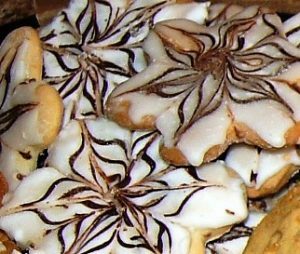 Cut the cookies with floured cookie cutters. Using a floured metal spatula, arrange the cookies 1 inch apart on unbuttered baking sheets. 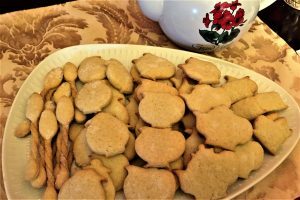 Sprinkle cookies with sugar, and bake for 12 minutes, or until they are lightly browned. Cool on racks.